Genetic testing for depression drugs is a new approach to selecting medications that may have value, especially in patients with treatment resistant depression. We have been using the Genecept Assay for patients with treatment resistant depression and have found that the results improve our ability to choose effective treatments. Patients who have failed multiple adequate trials of medications are much less likely to respond to a new treatment. Randomly selecting medications to try has a less than 15% likelihood of achieving a remission of the depression. And failure to achieve remission is associated with an increased risk of severe adverse consequences. A recent study “Pharmacogenetic-Guided Psychiatric Intervention Associated with Increased Adherence and Cost Savings”, in the American Journal of Managed Care (AJMC) (May, 2014) demonstrated a cost savings of 9.5% in outpatient costs over the four month trial period for patients who utilized the Assay compared to patients who did not. This equates to a relative annual outpatient cost savings of $1,686 per patient. Additionally, patients who used the Genecept Assay had significantly increased medication adherence rates when compared to matched controls. In addition, the results of an open label study presented at the Annual Meeting of the American Society of Experimental NeuroTherapeutics (ASENT) in Bethesda, Maryland in early 2014, and published in the June edition of Neurotherapeutics, titled, “Clinical Utility of Pharmacogenetic Testing in Psychiatric Patients in a Naturalistic Open Label Study” supported my experience. Both clinician-reported response rates (assessed by the CGI-I), and patient-reported response rates (assessed by the depression inventory) exceeded the seminal STAR*D depression trial for all patients, regardless of number of previous failed treatment trials. A middle aged professional with life long depression who has failed four adequate trials of antidepressants and is currently on high dose bupropion with a minimal response came into the clinic saying he was making a last effort to find more effective treatment. We ordered the Genecept Assay, which, among other findings, showed that he had a variant of the Catechol – O – Methyl Transferase (COMT) gene that predicted low levels of dopamine in the pre-frontal cortex. On the basis of that finding, as well as the fact that the only medication that he reported having had any response to in the past was bupropion, which affects dopamine levels, we decided to use pramipexole (a medication which increases dopamine and has been used primarily in patients with bipolar depression and patients with parkinson’s disease) to boost the effects of bupropion. Within one month he reported significant improvement, and within two months he was in remission from depression, for the first time in 15 years. A woman who had been struggling with depression for 7 years, and had had only partial response to serotonin antidepressants (SSRI’s) took the Genecept Assay and was found to be an ultra-high metabolizer at the cytochrome P 450 2 D6 enzyme. In other words, at standard doses of many SSRI’s she would have sub-therapeutic blood levels. The SSRI that had been the most effective, and which she was currently taking, was fluoxetine. On the basis of the results from this assay we decided to try titrating the fluoxetine dose up, and testing her fluoxetine blood levels along the way, to find a dose that would yield a therapeutic blood level for her. This is an expensive strategy, and the value of routine blood level testing is not at all clear, but in this case we had good reason to try it. At a dose of 80 mg a day of fluoxetine she had a therapeutic blood level (combined norfluoxetine and fluoxetine level of 200 ng/ml) and had a good response with remission of her depression. Cytochrome P450s are a large group of liver enzymes that act to metabolize medications. Polymorphisms in p450 enzymes account for significant variations in drug metabolism and the majority of psychotropic agents are metabolized by these pathways. Variance in the activity of cytochrome p450 can lead to abnormal drug metabolism and is associated with potential drug – drug interactions and treatment-emergent side effects. Individuals who are poor or intermediate metabolizers have a higher risk for treatment-emergent side effects, while ultrarapid metabolizers are at risk for sub-therapeutic blood levels of medications metabolized by these enzymes. 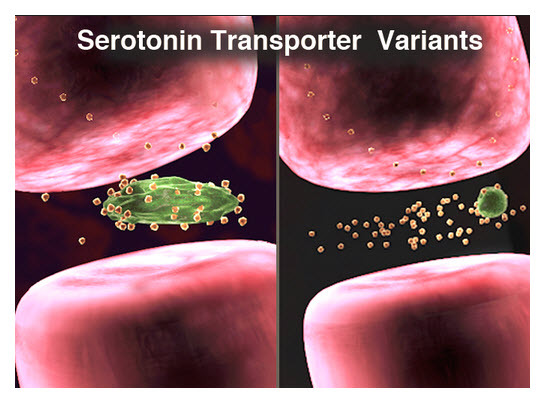 The serotonin transporter (5-HTT) is a high affinity carrier protein, localized to the plasma membrane of the presynaptic neuron. The role of 5-HTT is to remove serotonin (5-HT) from the synaptic cleft, resulting in serotonin reuptake into the presynaptic terminus. In general, L/L individuals report a better and faster response to SSRI therapy than S/S patients. While these L/L individuals may demonstrate appropriate response to SSRI therapy in 2 to 4 weeks, individuals with the short allele (L/S or S/S) may respond to SSRI therapy much more slowly or may benefit from non-selective antidepressants. The serotonin receptor subtype 2c (5HT2C) is well known for its role in satiety signaling. Variations in this receptor are associated with increased risk for hyperlipidemia, obesity and glucose intolerance, independent of drug response. In the presence of atypical neuroleptics, which antagonize this receptor, risk for metabolic syndrome and related side effects is increased in those patients who display the 5HT2C polymorphism. DRD2 gene encodes the dopamine receptor, which influences the binding of certain drugs in the brain, including anti-psychotics. The Deletion allele (Del) results in altered expression of this gene leading to changes in the binding affinity of this receptor. Individuals who carry a deletion allele (Del) demonstrate poorer antipsychotic response compared to insertion (Ins) homozygotes and are at higher risk of neuroleptic-induced side effects. The CACNA1C gene encodes for a subunit of the voltage-dependent calcium channel L-type, which is linked to glutamate activity. Gene variants in CACNA1C are associated with altered calcium gating and excessive neuronal depolarization. CACNA1C polymorphisms have been found in large genome-wide association studies to be modestly overrepresented in patients with bipolar, schizophrenia and cyclothymic disorders. Variants of this gene are not diagnostic and many healthy individuals also possess this polymorphism. The ANK3 gene encodes for the protein Ankyrin G, which is responsible for clustering voltage-gated sodium channels in the nodes of Ranvier of neurons. ANK3 polymorphisms may result in elevated sodium channel potential firing. Like CACNA1C, ANK3 variations have also been found in large genome-wide association studies to be modestly overrepresented in patients with bipolar, schizophrenia and cyclothymic disorders. Variants of this gene are not diagnostic and many healthy individuals also possess this polymorphism. The COMT gene encodes the enzyme Catechol-O-Methyltransferase, the primary factor which regulates dopamine levels in the pre-frontal cortex. Polymorphisms of this gene may lead to altered levels of dopamine in this area of the brain, resulting in behavioral consequences. High activity COMT (Val/Val) has been shown to impact executive functions, while low activity COMT (Met/Met) may be related to fibromyalgia. MTHFR is one enzyme responsible for the conversion of folic acid to methylfolate. Methylfolate is necessary for synthesis of serotonin, norepinephrine and dopamine, and it also acts as a methyl donor for the epigenetic silencing of various genes. The low activity T allele of MTHFR may result in reduced production of methylfolate and has been associated with various psychiatric disorders. Preliminary studies suggest that genotype specific supplementation with L-methylfolate may be beneficial in depression.